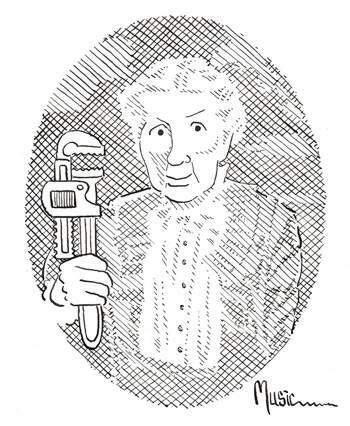 How Many One-Inch Pipes Will Fit Inside a Two-Inch Pipe? In this article Gazette technical wizard Pure Water Annie channels another technical writer, Ryan Lessing, of Watts Water Quality. Flow rate and pipe size correlation is not as simple as adding pipe diameters together, such as 1″ pipe + 1″ pipe = 2″ pipe. The rule of thumb is twice the diameter equals four times the flow. 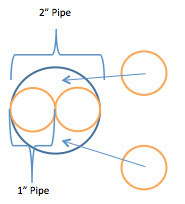 You can see in the figure that four 1″ pipes can fit inside a 2″ pipe. To estimate the pipe size required for a certain flow rate, the following formula can be used. Use a maximum flow velocity of 8.2 feet per second. The formula works for estimating pipe size requirements for short runs, such as 20 linear feet, in the installation plumbing only. It is not intended for longer plumbing runs, where more details need to be taken into account. Notice how 80 GPM for 2″ pipe is 4 times as much as the 20 GPM for 1″. As a final note, I’m sure you noticed how much Ryan’s logo is like mine. Except to point out that my logo was made before color pictures were invented, I’ll leave it to you to figure out who has borrowed from whom. Ryan Lessing formerly worked for Alamo Water in San Antonio and has been with Watts in San Antonio for several years. He is an active supporter of the Texas Water Quality Association chapter and is a past-president of the organization. He is also a bluegrass musician and a very nice person.